Abracatabby Arts: Kitty, Kitty, kitty! I opened up this blogger account several months ago and have done absolutely nothing with it... I seem to find blank pages daunting and I get "cat got your tongue syndrome" when I have to write anything LOL. Funny, 'cause I sure can talk allot... it just seems to get scrambled twixt the brain and the fingers when it bypasses the mouth! And I have arthritis which can make it difficult to type... extremely time consuming.. but, I have stuff to show you! So this is my first foray into Cyber Space Bloggo World... and if you are interested, a peek into my world. I am an artist, I have drawn, painted and created since I was very young. I have tried many different medias, but the one I have been compelled to work in the last few years has been wire art jewelry. 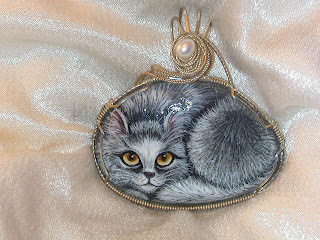 The Grey Kitten was painted by me using acrylic paints and sealed on a flat small stone and wire wrapped in sterling silver. A beautiful pink natural color pearl is wired in the swirl on the top.